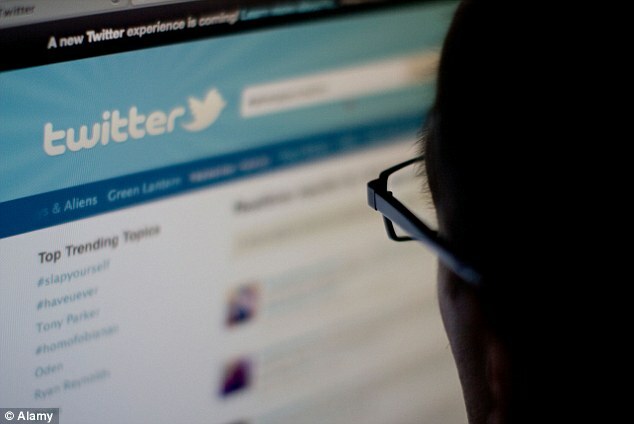 Social media: The modern stage for the bystander effect? What is the Diffusion of Responsibility? 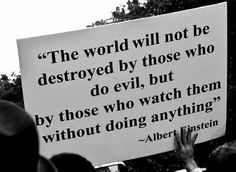 What Does the Bystander Effect Look Like Today? In order to understand what the modern stage of bystander looks like, the definition of bystander effect needs to be examined. Bystander effect specifically falls under social psychology which examines how people affect each other, both as individuals and as groups, and how the society they form influences people’s behaviour, thoughts and emotions. 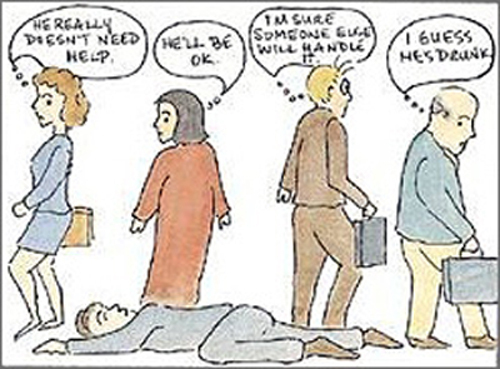 The bystander effect is a social psychological phenomenon that refers to circumstances in which individuals do not offer their help to a victim when others are present. Depending on the amount of bystanders present, an individual may feel less determined to act. The bystander effect can occur in any interaction with others, both online and in person. Two big factors that cause the bystander effect are conformity and diffusion of responsibility. First, bystanders need to notice the emergency. Bystanders then need to interpret the situation as one in which action is necessary and then further interpret it as one in which they specifically should act. Next, bystanders need to determine what form the action should take. Finally, they must actually act. At any point in this decision tree, the bystander can cycle back to previous decision points; it is not a linear decision process. These two articles provide a general understanding as to what goes on in the mind of a bystander. Bystanders’ responses can range across ignoring the situation, preventing the violence from escalating, supporting the victim, or calling upon outside resources for help. Bystander has the power to influence events. Whether individuals, groups, or nations, people frequently remain passive. This makes it easier for criminals to confidently commit their destructive actions. Due to their confidence, bystanders either accept the crime as okay or sometimes even join in. Uncertainty and consequences - When it is uncertain that someone needs help, the response rates are much lower and the response times are much higher. 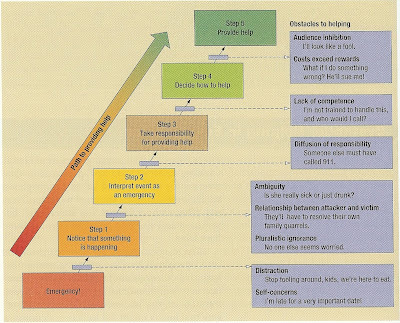 When it is clear that someone needs help (they are shouting “Help!”, for instance), the response rates are higher. The more specific the request for help, the higher the response rate. Understanding of environment - Bystanders who are not familiar with the environment (either the physical location or the circumstances) are less likely to offer assistance. Diffusion of responsibility - When people believe that someone else is responsible for an outcome, they are far less likely to intervene. Essentially, when it is someone else’s responsibility, they are less likely to act. Also people tend to diffuse responsibility, in fear of how they will seem around others. Audience inhibition refers to the risk of embarrassment if the situation turns out not to be an emergency. Individuals actively look to one another for cues about how to behave in the situation. The inaction of others will likely cause the inaction of the individual. These social cues can interact with the other mechanisms to increase the effect. If all individuals are initially inhibited, to the audience all will appear inactive. Every individual will perceive all others as inactive, further inhibiting action. Peer Pressure Individuals generally conform to group norms. Those who engage in deviant behaviours are often victims of negative sanctions by other group members, who exert pressure in order to obtain conformity. The presence of an audience to his or her actions inhibits the individual from acting. He or she does not want to appear foolish or inappropriate in front of others. Chekroun and Brauer (2002) examined whether the presence of bystanders would affect people’s use of social control with someone they perceived to be behaving badly. They tested whether people are less likely to exert social control when in the presence of bystanders. The article emphasizes the result of social control on a bystander. Bystander Effect is usually influenced by conformity. 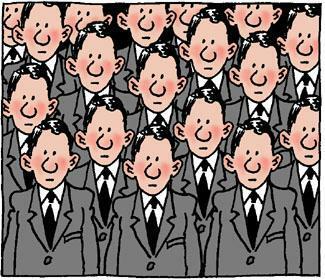 Conformity is a type of social influence that involves a change in a person's behaviour or beliefs in order to fit in with a group. This is a response to group pressure that is brought on from the physical presence of others or social norms/expectations. Conformity is also known as "yielding to group pressures". Some examples of these group pressures are bullying, teasing, criticism, or persuasion. Ultimately, when someone is conforming they are giving in to the majority position. The reason for this may be the desire to be liked or to be correct, or even to just fit in with others. Bystanders conform when they choose to avoid confrontation instead of speaking up when they disagree with something. Chekroun and Brauer agree that social control is very powerful when it comes to human behaviour (Chekroun & Brauer,2002, p. 853). The fear of being the victim also leads to conforming to deviant behaviour. A vital stage of the bystander effect is known to be Diffusion of responsibility. Diffusion of Responsibility is the assumption that because the problem is taking place in front of many people, you do not have to act on it. The witness sees no point in getting involved because they are sure that someone else will take care of it. Diffusion of responsibility is also one of the main four reasons behind the bystander effect. bystanders can strongly promote bullying and influence its persistence; however, bullying is more likely to come to an end when bystanders intervene and show disapproval. Some kids would like to help other bullied kids, but they do not do so because they are either confused, afraid, or simply do not know how to; they are uncertain of the consequences that will follow if they intervene. When kids become bystanders and do nothing, bullies tend to feel more empowered and most likely will continue to bully, harass, or hurt other kids whether physically, verbally, or even online. Parents and family members have great capacity in influencing their kids’ behaviours; therefor, acknowledging and understanding the bystander effect can push parents to empower and educate their children about bullying and the bystander effect where kids will be able to engage in more proactive roles and intervene when needed. 1- Take charge of the situation: Kids should be taught to be more proactive and engaging during emergency situations rather than relying on the crowd to initiate action. 2- Be directive and speak up: Apprise people to take actions directly when needed they are more likely to help and this can break the bystander effect. 3-Avoid physical confrontation and walk away: Avoid any strapping arguments that might lead to physical confrontations which may result in injuries or harm. 4-Be assertive and talk about it: Kids can take different approaches to prevent the bullying; specking to the bully privately if they know him/ her or reaching out to teachers, counsellors, school administrations, etc. 5-Raise awareness: Spreading awareness against bullying and promoting kids to take actions will more likely reduce bullying and the bystanders. Feld, S. L., & Robinson, D. T. (1998). Secondary bystander effects on intimate violence: when norms of restraint reduce deterrence. Journal Of Social & Personal Relationships, 15(2), 277. Researches on bystander effects indicate that bystanders encourage other individuals to behave likewise. However, the norms in western societies are against those stronger individuals using violence against weaker individuals and that the presence of a bystander reduces the likelihood for stronger individuals to use violence toward the weaker ones, yet the weak may become more likely to use violence toward the strong because of their reduced risks from retaliation. Results also shows that bystanders may affect upon each gender differently where it decreased the use of violence by males toward females and it increased the use of violence by females toward males. This is a story about the brutal murder of a young woman named Catherine “Kitty” Genovese, the crime that changed America ever since, and it’s considered one of the most frequent cited example of the bystander effect in introductory psychology textbooks. It can be assumed that this incident made the bystander effect publicly known. The murder took place on March 13, 1964 where ‘Kitty’ 28-years-old was returning home from work; as she approached her apartment entrance she was attacked, raped, and stabbed to death by a man later identified as Winston Moseley. What is astonishing about this case is not the crime itself, but the behaviour of the 38 bystanders eyewitnesses. Despite Genovese’s repeated calls for help, screams, and cries none of the 38 neighbours who saw the murder called the police; it was not until 30 minutes later that someone first contacted the police. This case initiated some kind of awareness towards the bystander effect and opened up the eyes of many psychologists to look more into this effect, study it, and understand it. * Weyand, D., Kent, A., Rosenthal, A. M. (. M., History Channel (Television network), & Arts and Entertainment Network. (1999). Silent witnesses: The Kitty Genovese murder. New York, NY: A & E Television Networks. This video was originally broadcasted on television in the series, "History's mysteries," by the History Channel. It contains Interviews of people connected with the Kitty Genovese murder, including A.M. Rosenthal, author of Thirty-eight witnesses : the Kitty Genovese case. This documentary video takes a closer look into the case and examine it in more details. Today it is very simple to interact with one another through social media, which can be a blessing until people take advantage. Everyone knows that when you write something online it stays online forever, but yet some do not hesitate to speak their minds even if their words are so cruel. Social media was meant to be a positive atmosphere where people can connect from all over the world, but sometimes it is a very negative place. For example, a very popular social media site called "Youtube" has billions of people on their servers everyday, and although the main purpose of the site is to upload and watch videos, on some videos there is a comment section below. Many people make jokes that only the small-minded take part in arguments in the comment section of Youtube, but this can be a recipe for disaster. Users are given the option to block comments from being posted, but it doesn't completely solve the problem. What people don't always realize is that when you post something, it is out there for everyone to see. Of course there are mean comments online but there are also mean posts to begin with. There are uncountable times when people will actually blackmail others with embarrassing or provocative photos or videos of the other person, and not only is this a form of cyber bullying but it is also against the law. The bystander effect comes into play when all of these awful things are being posted and people see it without reporting it and standing up for the targeted victim. Both online and in person, the bystander effect is a serious issue, and as long as people become more aware, it can be prevented. With more and more people becoming involved in social media everyday, it is definitely evolving into the modern stage for the bystander effect. This E-book discusses most issues that raise from various communication tools (social media sites, text messaging, emails, etc); while giving a closer look into cyberbullying that deals with any meanness, cruelty, or threats in the virtual world. Being involved in a mean or cruel virtual behaviours is a common experience that raise throughout grade 4 to 8 and remains stable until grade 11 and it appears that boys are more likely to be involved in those behaviours than girls. Parents play a major role in helping children and teens when it comes to cyberbullying where 72% of Canadian students agree to trust their parents; however, many students still seek different approaches for help whether from a friend, a trusted adult, or a teacher. In some cases contacting the police would be more appropriate or even dealing with the bully face-to-face, after all it all depends on the severity of the situation with a slight influence based on gender and environmental conditions. Anyhow, individuals who witness cyberbullying are in encouraged to take some actions; reports show that girls are more likely than boys to help cyber victims, in addition to youth in grade 6 through grade 9 who also have the tendency to intervene than younger or older students. School structure can also affect cyberbullying where it has the power to reduce its occurrences through firm laws and policies and teachers are considered one of the most common source of information on how to deal with cyberbullying and related issues. Dillon, K., & Bushman, B. (2015). Unresponsive or un-noticed? : Cyberbystander intervention in an experimental cyberbullying context. Computers In Human Behavior, 45, 144-150. Cyberbystanders are individuals who witness a degrading event or incident in the virtual world without intervening or giving aid and since Cyberbystanders play critical roles in cyberbullying and other acts of cyberagression; several research studies had to take place to examine such a phenomena in more depth. Bastiaensens, S., Vandebosch, H., Poels, K., Van Cleemput, K., DeSmet, A., & De Bourdeaudhuij, I. (2014). 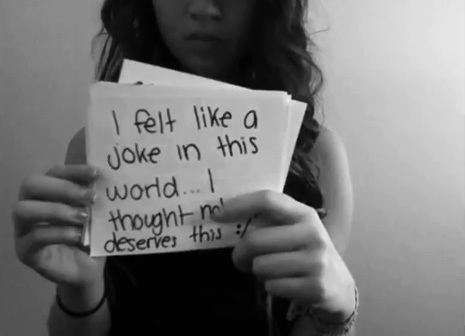 Cyberbullying on social network sites. An experimental study into bystanders’ behavioural intentions to help the victim or reinforce the bully. Computers In Human Behavior, 31, 259-271. Another study took place to examine the role of bystanders in cyberbullying; the study contained an experimental scenario that reported a harassing incident on Facebook, implying one suspect, one victim, and few other bystanders responding to it. The study aimed to analyze the participants’ behavioural intention whether they help the victim or reinforce the bully while taking into consideration the influence of major factors such as: severity of the incident, identity, gender, and the behaviour of other bystanders. Anyhow, four hundred and fifty-three second year students of Flemish secondary schools participated in the study. According to the article, “The results showed that bystanders had higher behavioural intentions to help the victim when they witnessed a more severe incident”, yet bystanders would still join in the cyberbullying when other bystanders whom taking part were good friends rather than acquaintances. However, both helping intentions and bullying behaviours differed based on gender.